Here's an interesting album for those who like an EM more or less ambiospherical but of a psybient kind. A native of Russia Vlad Nedelin is a Jazz percussionist who now lives in Stockholm. Member of the Sweden Jazz quartet Nybakat! he also composes, arranges and produces a more filmic and thematic music for years now. He signs here a first solo album endowed with a surprising sound aestheticism. 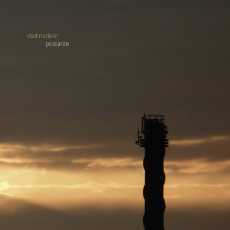 “Postante” is an interesting journey in the universe of music without borders. The themes here are very cinematographic and reflect a little this image of the artwork where we distinguish a big tower right in the middle of nowhere, except maybe that of an ocean because of this relation with the overabundance of water noises which encircle the 9 tracks of this very interesting first solo album of Vlad Nedelin. His approach breathes of a fascinating industrial moods with a plethora of metal noises, slow spectral woosh, white noises and glitches, endless rain and finally footsteps which resound on a sheet steel stone floor, a little as if we were inside a submarine. The composer and the Swedish-Russian arranger weaves here atmospheres closer of the agoraphobia in a sound panorama which flirts between Blade Runner and The City from Vangelis. "Totally Ripe" begins this adventure with a wave of which the rippling caresses glides over a fauna full of noises and metallic jingles. Squeaking of metal are roaring while the percussions run away from the random beatings and the drumming of the glitches. A heavy line of bass widens a threat which slowly turns into in a kind of rhythm. "Totally Ripe" becomes then a kind of very soft industrial down-tempo where jingles and percussions try to force a rhythm which remains floating and whose tragic crescendo establishes little by little this climate of claustrophobia which reigns around the theme of “Postante”. Straight away the listener will be very attracted by this lot of noises, subdivided into multiple layers of atmospheres, which does irradiate the fascination of this first solo work of Vlad Nedelin. This line of vampiric bass spreads its threats on "Nothing Disappears", a very ambient and somber track with a deep dramatic approach, among which the black lines of synth, and its whispers of spectres, as well as chords, which sound like an eerie guitar in The Cure, make us dive into the mysteries of this black tower set up in the middle of nowhere. Its last maritime breaths guides us towards the dark "Post Meridiem" and of its plasticized rain which crackles in an dazzling post-apocalyptic atmosphere. Long drones and hummings of machine can engender in a good imagination these machines in Terminator which were in search of human beings. Intense, "Post Meridiem" is unarguably the most cinematographic and the most uncomfortable track that I heard for some times. I like the way Vlad Nedelin is doing to create the illusion of a rhythm from the drops of water which seem to ooze out of a universe immured in the darkness. "Yet to Be Told" clears up a little these darkness with a more translucent approach where little by little a kind of Amerindian tribal rhythm takes shape with pulsations and percussions which accelerate the pace around harmonies sculptured in the improbable. The percussions throws rollings of skin, bringing "Yet to Be Told" towards a steady rhythm where a choreographer would have much to do to imagine a dance here. But it's feasible! "An Isle" is a long ambient track with beatings which throw their shadows in the murmurs of dark winds. We hear squeaking and doors of metal here to grate, as well as jingles which stamp such as footsteps of mouse. The effect in our ears is like to feel trapped inside a hatch of submarine. The atmospheres increase in a black crescendo to dive into the lively and syncopated rhythm of "Through the Tunnel" where we have the impression to run to lose breath in order to flee the claustrophobic atmosphere of "An Isle". The attention to detail here is surprising with a structure which is similar to an Ambient House but with a more jerky tempo. A tempo knotted with lively oscillations which jump up on a superb meshing of percussions with hits and tones of a disparity which enchants. The melody which floats looks like musical panting which eventually vanish into a finale which melts to the delicate morphic atmospheres of "Temporary Residence" where a choir of young virgins hums on chords which jump up by taking care of freeing an earworm for our quest of sounds curiosity. After the hollow winds which make trickling the drizzle of the caves in "Ante Meridiem", "Untouched" ends “Postante” with the shadows of carillons which spread their metallic aura among hollow winds and rustles. Fine and more iridescent lines float here and there, contributing to the metallic coolness of the drones and of its spectral choir which roams as much as its murmurs in a lost place of the universe where the ringings and the rain never stop resounding on a pavement of steel. Between concrete music, theme music, abstract music and ambient music, “Postante” succeeds to establish its place because of its structures of rhythms which come from another universe. There is a dramatic mass behind this music which fascinates and which enlightens the imagination while amazing this sense so precious to the fans of sounds and tones. It's a beautiful album. Strange certainly, but which has the peculiarity to bring us somewhere else.